Starring Alex Pettyfer, Dianna Agron, Timothy Olyphant, Teresa Palmer, Callan McAuliffe, Kevin Durand, Jake Abel, Jeff Hochendoner, Patrick Sebes, Greg Townley, Reuben Langdon, Emily Wickersham, Molly McGinnis, Brian Howe and Andy Owen. Screenplay by Alfred Gough, Miles Millar & Marti Noxon. Distributed by DreamWorks Pictures. 110 minutes. Rated PG-13. On the surface, at least, I Am Number Four appears to have some similarities to the Twilight films. It is based on a best-selling young adult novel about a gorgeous-but-outcast girl who falls in love with a hunky guy who is frequently without a shirt and also has a supernatural secret. However, if the Twilight movies are targeting the teen girl demographic, I Am Number Four has its eye set squarely on bringing in the boys. This might explain why the first film of the potential series was met with a much more muted response than its more well-known competition. Let’s face it, the teen boys have more options and if this movie wants to capture them, it really must bring its A game. And while I Am Number Four is actually a good deal better than I expected it might be, it just isn’t really good enough. What it is, though, is an occasionally uncomfortable but sometimes very entertaining mash-up of sci-fi blockbuster and teen angst. What is rather surprising is that the fantastic elements of the movie do not work as well as the smaller, more human scenes. Too many of the rampaging alien monsters seem a bit clichéd and silly. And while the high school scenes can in no way be described as unique, at least they have a certain amount of snap and drive which is somewhat missing in the more frenetic action scenes. Those action scenes, on the other hand, try to marry the ordinary with the extraordinary – giant killer monsters rampaging through high school hallways! – and yet it has a been-there/done-that vibe. Perhaps it is because of some extraordinarily silly looking monsters and aliens (they have fish scales on their faces for no apparent reason), but the threat never seems nearly as menacing as it wants to be. The storyline is rather a sci-fi staple. An ancient race on another planet is decimated, so they send some of their surviving children to Earth in order to learn how to come back home and defeat their enemies. Therefore, Number Four must balance the problem of being a (very handsome) new outcast in school with a big secret with the problem of staying alive when a bunch of giant monsters are trashing your high school. Plus, he is falling in puppy love with another high school outcast – who is similarly gorgeous for an outcast – a local aspiring photographer played by Dianna Argon of Glee. Wannabe heartthrob star Alex Pettyfer (who can also be seen in Beastly) is handsome and he can brood in manly despair as Number Four, but that pretty much covers his talent. Still, he does have some nice romantic scenes with Argon. The women come off much better – Argon is cute and sweet as his crush and midway through Teresa Palmer shows up and is a bundle of dynamite as hard-assed fellow survivor Number Six. When she is on screen, even the clichéd action sequences catch a spark. And Timothy Olyphant – an inherently interesting actor – is saddled with such a muddled character as Number Four’s guardian that even he can do little to make any kind of impression. The funny thing is that the teen angst sections of I Am Number Four are actually rather effective, but they end up taking a back seat to the much more pedestrian action sequences. 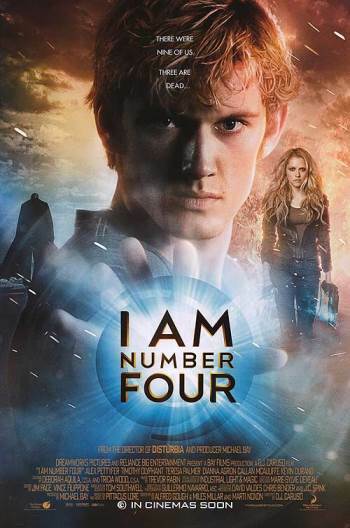 There is enough that goes right in I Am Number Four that it is worth a viewing, but this series is going to have to raise its game if it wants to be another Twilight. Copyright ©2011 PopEntertainment.com. All rights reserved. Posted: May 24, 2011. Tags: Alex Pettyfer, Alfred Gough, Andy Owen, Beastly, Brian Howe, Callan McAuliffe, Dianna Agron, Emily Wickersham, glee, Greg Townley, I Am Number Four, Jake Abel, Jay S. Jacobs, Jeff Hochendoner, Kevin Durand, Marti Noxon, Miles Millar, Molly McGinnis, movie review, Patrick Sebes, PopEntertainment.com, Reuben Langdon, Teresa Palmer, Timothy Olyphant, twilight. Bookmark the permalink.